A recital of songs spanning Debussy’s entire compositional career, from Tragédie written in early 1881, to his very last song, Noël des enfants qui n’ont plus de maisons from the end of 1915. 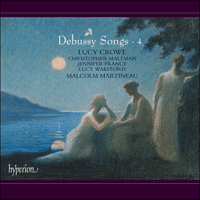 We bid adieu to this series in company of Lucy Crowe and, of course, Malcolm Martineau. We can have no precise date for the moment when Debussy decided to put his energies into composing rather than playing the piano, though the chances are it may have been 1879 when the seventeen-year-old failed for the second time to win a prize in the piano examination at the Paris Conservatoire. His first known composition, a song called Madrid to a poem by Alfred de Musset of which only one page survives, dates from this year (and, like many a young composer, for a time he favoured the medium for its convenience in being short and in having words as a prop to invention). In his case, enthusiasm for the mélodie was increased by the presence of the thirty-two-year-old Marie-Blanche Vasnier, who was among the first sopranos in a ladies’ choir he accompanied, and for whose light, high, agile voice he wrote twenty-nine songs between the end of 1880 and February 1884. Fifteen of them are featured on this album. The first song from these early months of 1881 is Tragédie, on a poem written by the little-known Léon Valade in imitation of Heine. Although marked to be sung ‘with a feeling of sadness’, it is in major keys almost throughout, and we may look rather to the dedication, to Mme Vasnier, calling her ‘the only muse who has ever inspired anything in me resembling a musical emotion (not to mention other things)’. From around the same time come Jane and La fille aux cheveux de lin, both on poems by Leconte de Lisle. The first of these shows that Debussy, though deeply smitten with Mme Vasnier and her green eyes, was no slave to coloratura: for an eighteen-year-old, the song shows an impressive command of modulation and of shape overall—we may note the syllabic word-setting (such a feature of his later songs and of Pelléas et Mélisande) and the understated repetitions on the phrase ‘J’aurai puisé ma mort prochaine’, all the more telling for that reason. In La fille aux cheveux de lin, the coloratura returns, with plenty of top B flats. But there is more to the song than vocal fireworks, as Debussy hints in an envoi to Mme Vasnier on the manuscript: ‘All I have in my head that is good is in this song—look and judge!’ (The only link with his later piano piece of this title is the key of G flat major.) Rondel chinois, also written early in 1881 on a poem by Marius Dillard, is a representative example of Debussy in melismatic mood. It bears the slightly curious dedication ‘To Madame Vasnier / the only one who can sing and make one forget all that this music contains that is unsingable and Chinese’. In fact it is far from unsingable, and certainly not Chinese, with some modal inflections and some Scotch snaps in the left hand doing duty for the exotic. In the summer of 1881 Debussy turned again to Alfred de Musset in the song Rondeau, dedicated not to Mme Vasnier but to Alexander, the son of Tchaikovsky’s patroness Nadezhda von Meck with whose family Debussy stayed in Moscow that summer, giving Alexander piano lessons among other duties. 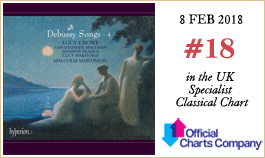 Here Debussy comes close to Massenet, with the same emphasis on the sixth and seventh degrees of the major scale in the voice part. Not only is the word-setting again syllabic, but the even flow is broken up with pauses and changes of pace that give the song an almost operatic feel. The composer used Musset for the last time early in 1883 in the duet Chanson espagnole, also set as a solo song by Delibes twenty years earlier with a conventional Spanish rhythm that Debussy was happy to borrow. Mme Vasnier must have had a friend with a similarly agile voice and no one is pretending the song is anything but a piece of fun. The same applies to Flots, palmes, sables, a setting for the unusual accompaniment of piano and harp, made on 2 June 1882 from one of Les nuits persanes by Armand Renaud. Here the composer enjoys himself with vaguely Middle Eastern melismata on the lines of those in Saint-Saëns’ Samson et Dalila (though Debussy would not have had a chance to hear this opera until 1890). The rival claims of sentiment and acrobatics are played out in the only three settings Debussy ever made of poetry by Théophile Gautier. Les papillons from the end of 1881 uses the poem more famously set by Chausson the previous year, a version that may well have suggested the idea to Debussy after its first performance at a Société nationale concert on 9 April 1881. Both composers give the piano a fluttering right hand (Debussy’s dedication to Mme Vasnier describes the song as having been ‘empapillonné’ by him) and Debussy follows Chausson in withdrawing the accompaniment on the phrase ‘Fleur de mon âme’, but otherwise his word-setting is more conventional than that of his elder colleague. Acrobatics are to the fore in Séguidille, from the end of 1882, with over thirty bars of trills and ornaments in the voice part before we hear any words (among the ornaments are the little curling triplets that were to survive into Debussy’s mature music). His final Gautier setting, Coquetterie posthume composed on 31 March 1883 on a poem from the collection Émaux et Camées, again mixes sentiment and acrobatics but also demonstrates a sure hand with modulations. There are nuances in the piano part too: at the mention of ‘la couche / D’où nul encor ne s’est levé’ we hear a touch of the ‘Dies irae’, staccato in the left hand, and at the reprise that hand gets stuck on six low Gs, giving a marvellous effect of struggling against the inevitable. Manuscripts of Chanson espagnole and Coquetterie posthume are found in a bound copy of thirteen songs dedicated to Mme Vasnier (the so-called ‘Recueil Vasnier’) and presumably presented to her at some point during or after February 1884, the date of the last song, Regret. The volume also contains songs on six poems by Paul Bourget and five by Paul Verlaine, three of which he was to rewrite for the first set of Fêtes galantes in 1891. Fantoches, dated 8 January 1882, was his first attempt at Verlaine. A history of French literature published in 1922 describes Verlaine’s poetry as being imbued with ‘a singularly penetrating melancholy’, and Debussy’s ability to portray this is nothing less than astonishing in a lad of nineteen or twenty. In Fantoches, the eerie mood is established right from the start with startling chromatics and the voice entering unexpectedly on a discord. Debussy kept most of the first half of the song in his 1891 version, and indeed it would be hard to improve on the image of the Bolognese doctor picking his samples: dedicated, yes—or perhaps just slightly obsessed? With En sourdine, marked ‘Slow, in a very veiled sonority’, we enter, really for the first time, the dreamworld that Debussy was to make his own. The pulsing chord of the ninth in the first bar is harmonically a bolder start than any that Fauré or Chabrier had made by this year. But the crux is that bar 2 is even more dissonant, so that when bar 1 then returns, on the opening word ‘Calmes’, it sounds like a resolution. In 1891 Debussy rewrote the song almost entirely, retaining but a vestige of the last two lines. He wrote his last three songs for her in February 1884. Two of them, La romance d’Ariel and Regret, conclude the ‘Recueil’, but the third was omitted. Certainly the poem Apparition led him to a longer and more complex song than any he had composed so far, and maybe he felt it would unbalance the collection. Whereas the style of the moonlit opening is suitably restrained, the piano’s outburst for ‘C’était le jour béni …’ is unmistakably operatic, and it is pertinent to note that the song was completed on 8 February 1884, only three weeks after the premiere of Massenet’s Manon at the Opéra-Comique. Anyone lucky enough to hear this song shortly after its composition would have been tempted to put money on Debussy for the Prix de Rome that year. And they would have won. Debussy’s most notable songs during the rest of the 1880s were the six Ariettes oubliées and the Cinq poèmes de Baudelaire, published in 1888 and 1890 respectively. In the Baudelaire songs his writing reached a peak of complexity, and from here on his textures became more transparent, as if he recognized that such complexity could go no further without lapsing into incoherence. Beau soir, published in 1891, was his last public collaboration with Paul Bourget (with whom he had been in touch for several years and who by now had given up poetry for novel-writing and criticism). Although we cannot be sure exactly when Debussy composed the song, there is no mistaking the individual blend of memorable melody, sometimes surprising harmony (for example, the sudden minor chord on ‘roses’), fastidious word-setting and subtle textures (as mankind begin its descent down to the tomb, for three bars the harmony descends ‘entombed’ between octaves in the outer parts). Also published in 1891 were the two Arabesques for piano in which, although Debussy was still feeling his way towards an individual keyboard style (his song accompaniments were already more forward-looking), there is no mistaking the charm that was as much a feature of the music as of the man. The first Arabesque also echoes Verlaine’s love of odd numbers: the first three paragraphs are of 5, 11 and 9 bars, an imbalance that adds to the piece’s ethereal, floating quality. Debussy wrote his last song, Noël des enfants qui n’ont plus de maisons in the days before an operation for cancer on 7 December 1915. It brings to mind his advice from his deathbed in March 1918 to a young composer: ‘Méfiez-vous de l’exceptionnel!’ (‘Beware the exceptional!’) Here is a simplicity born of years of experience—not a great song, certainly, but a touching one despite its final blatant demand for victory. The composer, now self-styled ‘musicien français’, seems to be prophesying the cult of simplicity that, in the hands of the Groupe des Six, would take over French music after his death. On ignore à quelle date précise Debussy décida de se consacrer à la composition plutôt qu’à une carrière de pianiste, mais ce pourrait être en 1879 lorsque, à l’âge de dix-sept ans, il ne parvint pas, à sa seconde tentative, à remporter un prix de piano au Conservatoire de Paris. Sa première composition connue, une mélodie intitulée Madrid sur un poème d’Alfred de Musset dont il ne nous est parvenu qu’une seule page, date de cette année-là (et, comme beaucoup de jeunes compositeurs, il préféra ce moyen d’expression pendant un certain temps car il avait l’avantage d’être court et d’avoir des mots pour étayer l’invention). Dans son cas, l’enthousiasme pour la mélodie fut accru par la présence de Marie-Blanche Vasnier; elle avait trente-deux ans et chantait parmi les premières sopranos dans un chœur de dames qu’il accompagnait. Entre la fin de l’année 1880 et le mois de février 1884 il écrivit vingt-neuf mélodies pour sa voix légère, aiguë et agile. Quinze d’entre elles figurent dans cet album. La première mélodie datant de ces premiers mois de 1881 est Tragédie, sur un poème du peu connu Léon Valade d’après Heine. Même s’il est indiqué qu’elle doit être chantée «avec un sentiment de tristesse», elle est presque entièrement écrite dans des tonalités majeures, et il faut plutôt regarder la dédicace à Mme Vasnier, qualifiée de «seule muse qui m’ait jamais inspiré quelque chose ressemblant à un sentiment musical (je ne parle que de cela)». À peu près à la même époque, il y eut aussi Jane et La fille aux cheveux de lin, toutes deux sur des poèmes de Leconte de Lisle. La première montre que Debussy, bien que fou amoureux de Mme Vasnier et de ses yeux verts, n’était pas esclave de la coloratura: pour un garçon de dix-huit ans, cette mélodie montre une impressionnante maîtrise d’ensemble de la modulation et de la forme—on notera l’écriture musicale syllabique dont il pare les mots (une caractéristique de ses mélodies ultérieures et de Pelléas et Mélisande) et les répétitions discrètes sur la phrase «J’aurai puisé ma mort prochaine», d’autant plus révélatrices pour cette raison. Dans La fille aux cheveux de lin, la coloratura revient, avec beaucoup de si bémol aigus. Mais cette mélodie est bien davantage qu’un feu d’artifice vocal, comme le laisse entendre Debussy dans un envoi à Mme Vasnier sur le manuscrit: «Tout ce que je peux avoir de bon, dans le cerveau est là-dedans—Voyez et jugez» (le seul lien avec sa pièce pour piano ultérieure qui porte le même titre est la tonalité de sol bémol majeur). Rondel chinois, également écrit au début de l’année 1881 sur un poème de Marius Dillard, est un exemple représentatif de Debussy dans une ambiance mélismatique. Cette mélodie porte une dédicace assez curieuse: «À Madame Vasnier, la seule qui peut chanter et faire oublier tout ce que cette musique a d’inchantable et de chinois». En fait, elle est loin d’être inchantable, et certainement pas chinoise, avec quelques inflexions modales et quelques rythmes lombards à la main gauche pour le côté exotique. Au cours de l’été 1881, Debussy se tourna à nouveau vers Alfred de Musset pour la mélodie Rondeau, dédiée non pas à Mme Vasnier mais à Alexandre, le fils de la protectrice de Tchaïkovski Nadejda von Meck; cet été-là, Debussy séjourna chez elle à Moscou, donnant notamment des leçons de piano à Alexandre. Ici, Debussy se rapproche de Massenet, avec la même accentuation sur les sixième et septième degrés de la gamme majeure dans la partie vocale. Les vers sont une fois encore mis en musique de façon syllabique, mais le flux régulier est brisé par des points d’orgue et des changements de rythme qui donnent à cette mélodie quelque chose de presque lyrique. Le compositeur utilisa Musset pour la dernière fois au début de l’année 1883 dans le duo Chanson espagnole, que Delibes avait également mis en musique vingt ans plus tôt, mais sous forme de mélodie à une voix, avec un rythme espagnol conventionnel que Debussy repris volontiers. Mme Vasnier devait avoir une amie dotée d’une voix aussi agile et personne ne prétend que cette chanson soit autre chose qu’un divertissement. On peut en dire autant de Flots, palmes, sables, dont l’accompagnement réunit, chose inhabituelle, un piano et une harpe; cette mélodie fut écrite le 2 juin 1882 sur l’une des Nuits persanes d’Armand Renaud. Ici, le compositeur s’amuse avec des mélismes vaguement moyen-orientaux dans le genre de ceux que l’on trouve dans Samson et Dalila de Saint-Saëns (mais Debussy n’eut pas l’occasion d’entendre cet opéra avant 1890). Il y a des aspects sentimentaux et acrobatiques qui s’opposent dans les trois seules œuvres que Debussy composa sur des poèmes de Théophile Gautier. Les papillons, qui datent de la fin de l’année 1881, reprennent le fameux poème mis en musique par Chausson l’année précédente, une version qui pourrait très bien avoir donné à Debussy l’idée d’en faire autant après sa première exécution lors d’un concert de la Société nationale, le 9 avril 1881. Les deux compositeurs donnent au piano une main droite virevoltante (la dédicace de Debussy à Mme Vasnier décrit cette mélodie comme ayant été «empapillonnée» par lui) et Debussy suit Chausson en supprimant tout accompagnement sur la phrase «Fleur de mon âme», mais sa façon de mettre le texte en musique est plus conventionnelle que celle de son aîné. Les aspects acrobatiques occupent le premier plan dans Séguidille, qui date de la fin de l’année 1882, avec plus de trente mesures de trilles et d’ornements à la partie vocale avant que l’on entende la moindre parole (parmi les ornements figurent les petits triolets ondulants qui allaient se perpétuer dans la musique de la maturité de Debussy). Sa dernière œuvre sur un texte de Gautier, Coquetterie posthume, composée le 31 mars 1883 sur un poème du recueil Émaux et Camées, mélange à nouveau sentiment et acrobaties mais montre aussi une main sûre en matière de modulations. Il y a également des nuances intéressantes dans la partie de piano: sur «la couche / D’où nul encor ne s’est levé», on entend une pointe de «Dies irae», staccato à la main gauche et, à la reprise, cette main s’enlise dans six sol graves, donnant un magnifique effet de lutte contre l’inévitable. Les manuscrits de la Chanson espagnole et de Coquetterie posthume se trouvent dans un exemplaire relié de treize mélodies dédiées à Mme Vasnier (celui qu’on appelle «Recueil Vasnier») et qui lui fut sans doute offert au plus tôt en février 1884, date de la dernière mélodie, Regret. Ce volume contient aussi des mélodies sur six poèmes de Paul Bourget et cinq de Paul Verlaine, dont trois allaient être remaniées pour le premier recueil des Fêtes galantes en 1891. Fantoches, daté du 8 janvier 1882, fut sa première tentative sur des vers de Verlaine. Une histoire de la littérature française publiée en 1922 décrit la poésie de Verlaine comme imprégnée «d’une mélancolie singulièrement pénétrante» et la capacité de Debussy à évoquer cette mélancolie est vraiment étonnante pour un jeune homme de dix-neuf ou vingt ans. Dans Fantoches, l’atmosphère angoissante est créée dès le début avec un chromatisme saisissant et la voix entre de façon inattendue sur une dissonance. Debussy conserva la majeure partie de la première moitié de cette mélodie dans sa version de 1891 et, en fait, il serait difficile d’améliorer l’image du docteur Bolonais cueillant des simples: zélé oui—ou peut-être juste légèrement obsédé? Avec En sourdine, marqué «Lent, dans une sonorité très voilée», on entre réellement pour la première fois dans le monde imaginaire que Debussy allait faire sien. L’accord pulsé de neuvième à la première mesure est un point de départ plus audacieux sur le plan harmonique que tout ce que Fauré ou Chabrier avaient fait à cette date. Mais ce qui est essentiel, c’est que la deuxième mesure est encore plus dissonante, si bien que lorsque la première revient sur le premier mot «Calmes», elle ressemble à une résolution. En 1891, Debussy réécrivit presque entièrement cette mélodie, en ne conservant qu’un vestige des deux dernières lignes. Les trois dernières mélodies qu’il écrivit pour elle datent de février 1884. Deux d’entre elles, La romance d’Ariel et Regret, concluent le «Recueil», mais la troisième n’y figure pas. Assurément, le poème Apparition le mena à écrire une mélodie plus longue et plus complexe que toutes celles qu’il avait composées jusqu’alors, et il pensa peut-être qu’elle allait déséquilibrer le recueil. Si le style du début éclairé par la lune est d’une sobriété appropriée, l’emportement du piano sur «C’était le jour béni …» est d’un lyrisme indéniable, et il est intéressant de noter que cette mélodie fut achevée le 8 février 1884, juste trois semaines après la création de Manon de Massenet à l’Opéra-Comique. Quiconque eut la chance d’entendre cette mélodie peu après sa composition dut être tenté de miser sur Debussy pour le Prix de Rome cette année-là, et avec succès. Les plus remarquables mélodies de Debussy écrites à la fin des années 1880 furent les six Ariettes oubliées et les Cinq poèmes de Baudelaire, publiées respectivement en 1888 et 1890. Dans les mélodies sur des textes de Baudelaire, son écriture attint un sommet de complexité et, à partir de là, ses textures devinrent plus transparentes, comme s’il reconnaissait qu’une telle complexité ne pouvait aller plus loin sans tomber dans l’incohérence. Beau soir, publiée en 1891, fut sa dernière collaboration publique avec Paul Bourget (avec qui il était en contact depuis plusieurs années et qui avait alors renoncé à la poésie pour écrire des romans et des critiques). Si l’on ignore la date exacte à laquelle Debussy composa cette mélodie, on ne peut se tromper sur ce mélange personnel de lignes mélodiques faciles à mémoriser, d’harmonies parfois surprenantes (par exemple le soudain accord mineur sur «roses»), de minutie dans la manière de mettre les mots en musique et de textures subtiles (lorsque l’humanité commence sa descente au tombeau, l’harmonie descend pendant trois mesures «ensevelie» entre des octaves aux parties externes). Les deux Arabesques pour piano furent aussi publiées en 1891, et même si Debussy était encore à la recherche d’un style pianistique personnel (ses accompagnements de mélodies étaient déjà davantage tournés vers l’avenir), il est impossible de ne pas y reconnaître ce charme caractéristique propre à sa musique comme à l’homme. La première Arabesque rappelle aussi le goût de Verlaine pour les nombres impairs: les trois premiers paragraphes comportent 5, 11 et 9 mesures, un déséquilibre qui accentue le côté éthéré et flottant de cette pièce. Pour finir, les trois dernières mélodies enregistrées ici présentent Debussy comme compositeur et poète; Mme Vasnier n’est plus qu’un souvenir en train de s’effacer. Ses poèmes pour les Proses lyriques, publiées en 1895, lui avaient sans doute donné satisfaction car sur la partition des Nocturnes, en 1900, on trouve l’annonce de la prochaine publication d’un autre cycle sur ses propres textes: «Nuits blanches, 5 Poèmes pour une voix avec accompagnement de piano». La première femme de Debussy, Lilly, possédait un carnet contenant les paroles des cinq poèmes, mais il est aujourd’hui perdu et tout ce qui nous est parvenu ce sont deux des cinq mélodies annoncées. Elles montrent toutes deux un développement du langage harmonique de Debussy avec des accords par tons entiers, des accords de quartes et de quintes et, dans «Nuit sans fin», un passage d’organum sur les mots «Jusqu’à retenir son âme entre mes lèvres!» Après cette lamentation sur l’absence de la bien-aimée, la seconde mélodie nous rappelle que, à l’époque où il écrivit ces deux mélodies, en juillet et septembre 1898, il avait terminé la particelle de Pelléas et Mélisande, et les paroles de la première moitié de la mélodie reflètent les terribles craintes de Golaud quant à la possible infidélité de Mélisande, alors que les passages d’écriture pianistique dépouillée et l’ostinato rythmique intermittent à la basse (5 noires + 2 croches) reflètent l’admiration que Debussy portait à Moussorgski. Dans la seconde moitié de la mélodie, l’amour physique submerge les doutes du poète et la musique devient finalement plus lyrique (le manuscrit donne cinq titres possibles pour cette mélodie, en plus de celui qui reprend les quatre premiers mots: «La lueur de ses grands yeux; Lassitude heureuse; Une fleur trop aimée du soleil; L’impossible pardon; et Le voile de l’oubli»). Debussy écrivit sa dernière mélodie, Noël des enfants qui n’ont plus de maisons, pendant les jours qui précédèrent une opération d’un cancer, le 7 décembre 1915. Elle fait penser au conseil qu’il donna sur son lit de mort à un jeune compositeur en mars 1918: «Méfiez-vous de l’exceptionnel!» On trouve ici une simplicité résultant d’années d’expérience—ce n’est certainement pas une grande mélodie, mais elle est touchante malgré sa criante demande finale de victoire. Le compositeur, désormais autoproclamé «musicien français», semble prophétiser le culte de la simplicité qui, entre les mains du Groupe des Six, allait prendre le contrôle de la musique française après sa mort. Der Augenblick, in dem Debussy den Entschluss fasste, sich in erster Linie dem Komponieren anstelle des Klavierspielens zu widmen, lässt sich nicht genau festmachen, doch ist er wohl im Jahre 1879 anzusiedeln, als der 17-Jährige bei der Preisverleihung nach den Klavierprüfungen am Pariser Conservatoire bereits zum zweiten Mal leer ausgegangen war. Seine erste bekannte Komposition, ein Lied mit dem Titel Madrid auf ein Gedicht von Alfred de Musset, von dem jedoch nur eine Seite überliefert ist, stammt aus demselben Jahr (und, wie viele junge Komponisten, bevorzugte er dieses Genre eine Zeitlang aufgrund seiner Kürze und der unmittelbaren Inspiration durch die Texte). In seinem Falle verstärkte sich die Begeisterung für die mélodie durch die Anwesenheit der 32-jährigen Marie-Blanche Vasnier, die in einem Damenchor, welchen er begleitete, ersten Sopran sang, und für deren leichte, hohe und agile Stimme er vom Ende des Jahres 1880 bis zum Februar 1884 insgesamt 29 Lieder komponierte. 15 davon sind hier zu hören. Das erste Lied vom Beginn des Jahres 1881 ist Tragédie, dem ein an Heine angelehntes Gedicht des kaum bekannten Schriftstellers Léon Valade zugrunde liegt. Obwohl es „mit einem Ausdruck der Traurigkeit“ auszuführen ist, steht es fast durchweg in Dur—Debussys Widmung an Mme Vasnier ist hier erleuchtend, in der er sie als „die einzige Muse, die jemals etwas wie ein musikalisches Gefühl in mir hervorgerufen hat“ bezeichnet. Um dieselbe Zeit entstanden auch Jane und La fille aux cheveux de lin, jeweils auf Gedichte von Leconte de Lisle. Das erste der beiden zeigt, dass Debussy trotz seiner Verehrung für Mme Vasnier (und ihre grünen Augen) der Koloratur nicht hörig war: für einen 18-Jährigen demonstriert dieses Lied eine beeindruckende Beherrschung von Modulation und Form insgesamt—es sei dabei auf die syllabische Vertonung hingewiesen (ein wichtiges Charakteristikum seiner späteren Lieder und von Pelléas et Mélisande), sowie auf die dezenten Wiederholungen des Satzes „J’aurai puisé ma mort prochaine“, die aus diesem Grunde umso bedeutsamer sind. In La fille aux cheveux de lin kehrt die Koloratur mit vielen hohen Bs zurück. Doch hat das Lied mehr vorzuweisen als vokale Kunststückchen, wie Debussy in einer Zueignung an Mme Vasnier im Manuskript schreibt: „Alles Gute, was ich im Kopf habe, ist in diesem Lied—sehen und urteilen Sie selbst.“ (Die einzige Verbindung zu seinem späteren Klavierstück mit demselben Titel ist die Tonart Ges-Dur.) Rondel chinois entstand ebenfalls zu Beginn des Jahres 1881, und zwar auf ein Gedicht von Marius Dillard: Debussy zeigt sich hier von seiner melismatischen Seite. Es trägt eine etwas sonderbare Widmung: „An Madame Vasnier / die Einzige, die singen und einen das Unsingbare und Chinesische dieser Musik vergessen lassen kann.“ Tatsächlich ist dieses Lied alles andere als unsingbar; chinesisch ist es ebenso wenig—nur einige modale Wendungen und lombardische Rhythmen in der linken Hand sorgen für etwas Exotik. Im Sommer 1881 wandte Debussy sich in dem Lied Rondeau wieder Alfred de Musset zu, und widmete es diesmal allerdings nicht Mme Vasnier, sondern dem Sohn von Tschaikowskys Mäzenin Nadeschda von Meck, Alexander: der Komponist verbrachte jenen Sommer bei Familie von Meck in Moskau, gab Alexander Klavierstunden und übernahm noch weitere Pflichten in deren Haushalt. In diesem Lied nähert Debussy sich Massenet an, indem er die sechste und siebente Stufe der Durtonleiter in der Singstimme in gleicher Weise betont. Nicht nur ist die Textvertonung wieder syllabisch gehalten, sondern auch der musikalische Fluss wird von Pausen und Gangartwechseln unterbrochen, was dem Lied einen fast opernhaften Charakter verleiht. Zu Beginn des Jahres 1883 griff der Komponist in dem Duett Chanson espagnole zum letzten Mal auf die Dichtungen Mussets zurück; Delibes hatte denselben Text zwanzig Jahre zuvor als Sololied vertont und dabei einen konventionellen spanischen Rhythmus verwendet, welchen Debussy hier ebenfalls einsetzte. Mme Vasnier muss eine Freundin mit einer ähnlich agilen Stimme gehabt haben, und niemand würde leugnen, dass dieses Stück nichts anderes ist als ein Spaß. Dasselbe gilt für Flots, palmes, sables, eine Vertonung mit der ungewöhnlichen Begleitkombination von Klavier und Harfe, welche am 2. Juni 1882 zu einer der Nuits persanes von Armand Renaud entstand. Hier genießt der Komponist entfernt orientalisch anmutende Melismen in der gleichen Art wie sie in Saint-Saëns’ Samson et Dalila anzutreffen sind (obwohl Debussy diese Oper nicht vor 1890 gehört haben kann). Die konkurrierenden Ansprüche des Gefühls einerseits und der Akrobatik andererseits kommen in den einzigen drei Vertonungen zum Ausdruck, die Debussy zu Dichtungen von Théophile Gautier anfertigte. Les papillons entstand gegen Ende des Jahres 1881 und ist demselben Gedicht gewidmet, das Chausson im Jahr davor vertont hatte (und das einen höheren Berühmtheitsgrad erlangte)—jene Version mag Debussy als Inspirationsquelle gedient haben, als er die erste Aufführung bei einem Konzert der Société nationale am 9. April 1881 gehört hatte. Beide Komponisten geben der Klavierstimme eine flatternde rechte Hand (in der Widmung an Mme Vasnier schreibt Debussy, sein Lied sei „empapillonné“), und Debussy folgt dem Beispiel Chaussons insofern, als dass er die Begleitung bei der Phrase „Fleur de mon âme“ schweigen lässt; ansonsten ist seine Vertonung jedoch konventioneller gehalten als die des älteren Kollegen. In Séguidille, komponiert am Ende des Jahres 1882, tritt das Akrobatische mehr in den Vordergrund, wobei die Singstimme über 30 Takte lang mit Trillern und Ornamenten glänzt, bevor Worte hörbar werden (unter den Ornamenten finden sich auch jene kleinen kräuselnden Triolen, die noch in den reifen Werken Debussys auftauchen). Seine letzte Gautier-Vertonung, Coquetterie posthume, komponierte er am 31. März 1883 zu einem Gedicht aus der Sammlung Émaux et Camées, und auch hier kommen sowohl Gefühl als auch Akrobatik zum Zug, doch demonstriert er beim Modulieren eine ebenso sichere Hand. Die Klavierstimme ist gleichfalls nuanciert: bei den Worten „la couche / D’où nul encor ne s’est levé“ ist ein Anflug des „Dies irae“ zu hören, ein Staccato in der linken Hand, und in der Reprise bleibt dieselbe Hand auf sechs tiefen Gs stecken, was für einen wunderbaren Effekt des Ringens mit dem Unvermeidlichen sorgt. Die Manuskripte der Chanson espagnole und der Coquetterie posthume finden sich in einer gebundenen Ausgabe von 13 Mme Vasnier gewidmeten Liedern (der sogenannte „Recueil Vasnier“), welche ihr vermutlich im Februar 1884 (dem Entstehungsdatum des letzten Liedes, Regret) oder etwas später überreicht wurde. Dieser Band enthält zudem Lieder auf sechs Gedichte von Paul Bourget und fünf von Paul Verlaine, von denen Debussy drei für den ersten Band seiner Fêtes galantes von 1891 umarbeitete. Fantoches ist auf den 8. Januar 1882 datiert und war seine erste Verlaine-Vertonung. Eine französische Literaturgeschichte von 1922 charakterisiert Verlaines dichterisches Oeuvre als dominiert von einer „ganz und gar durchdringenden Melancholie“—Debussys Fähigkeit, dies (im Alter von 19 oder 20 Jahren) in Musik umzusetzen, ist frappierend. In Fantoches wird die unheimliche Stimmung gleich zu Beginn durch erschreckende chromatische Passagen sowie den unerwarteten Einsatz der Stimme auf einer Dissonanz hergestellt. In der Version von 1891 behielt Debussy die erste Hälfte des Liedes zum größten Teil bei, und es ist in der Tat kaum vorstellbar, dass das Bild der Bologneser Arztes, der seine Proben einsammelt, noch verbessert werden kann—engagiert, ja; oder vielleicht etwas obsessiv? Mit En sourdine, welches mit „Langsam, mit sehr verschleiertem Klang“ bezeichnet ist, begeben wir uns erstmals in die Traumwelt, die Debussy sich zu eigen machen sollte. Der pulsierende Nonakkord im ersten Takt ist ein in harmonischer Hinsicht waghalsigerer Beginn als alles, was Fauré oder Chabrier bis zu diesem Zeitpunkt gemacht hatten. Die Crux liegt jedoch darin, dass Takt 2 noch dissonanter ist, was die Wiederholung des ersten Takts bei dem ersten Wort „Calmes“ [„ruhig“] wie eine Auflösung erscheinen lässt. 1891 schrieb Debussy das Lied fast vollständig um—nur Spuren der letzten beiden Zeilen blieben erhalten. Im Februar 1884 schrieb er seine drei letzten Lieder für sie. Zwei davon, La romance d’Ariel und Regret schließen den „Recueil“ ab, das dritte wurde jedoch ausgelassen. Gewiss regte das Gedicht Apparition ihn zu einem längeren und komplexeren Lied an, als er bis dahin komponiert hatte, und möglicherweise war er der Ansicht, dass damit das Gleichgewicht der Sammlung gestört würde. Während der Stil des mondbeschienenen Beginns angemessen zurückhaltend ist, wirkt der Ausbruch des Klaviers bei „C’était le jour béni…“ unmissverständlich opernhaft, und es ist sicherlich relevant, darauf hinzuweisen, dass das Lied am 8. Februar 1884 fertiggestellt wurde—nur drei Wochen nach der Premiere von Massenets Manon an der Opéra-Comique. Alle diejenigen, die sich in der glücklichen Position fanden, dieses Lied kurz nach seiner Entstehung zu hören, wären sicherlich versucht gewesen, darauf zu setzen, dass Debussy in jenem Jahr den Prix de Rome erhalten würde. Und sie hätten ihre Wette gewonnen. Debussys bedeutendsten Lieder der restlichen 1880er Jahre waren die sechs Ariettes oubliées und die Cinq poèmes de Baudelaire, die jeweils 1888 und 1890 erschienen. In den Baudelaire-Liedern erreichte sein kompositorischer Stil einen Gipfel der Komplexität, und von nun an wurden seine Strukturen transparenter, als habe er eingesehen, dass eine derartige Vielschichtigkeit nicht fortgeführt werden konnte, ohne dabei in Beliebigkeit zu stürzen. Beau soir, veröffentlicht im Jahre 1891, war seine letzte öffentliche Gemeinschaftsproduktion mit Paul Bourget (mit dem er über mehrere Jahre hinweg in Kontakt gewesen war und der inzwischen sein dichterisches Schaffen aufgegeben hatte, um sich stattdessen als Roman-Autor und Kritiker zu betätigen). Zwar kann nicht genau festgemacht werden, wann Debussy dieses Lied komponierte, doch ist die individuelle Mischung von einprägsamer Melodik, zuweilen überraschender Harmonik (z.B. bei dem plötzlichen Mollakkord auf „roses“), penibler Textvertonung und subtilen Texturen (wenn die Menschheit ihren Abstieg ins Grab beginnt, steigt die Harmonie über drei Takte „eingekerkert“ zwischen Oktaven in den Außenstimmen hinab) unverkennbar. Ebenfalls 1891 herausgegeben wurden die beiden Arabesques für Klavier, in denen der Charme als musikalisches und auch persönliches Charakteristikum Debussys hervortritt, auch wenn sich sein individueller Klavierstil noch herausbildete (seine Liedbegleitungen waren bereits zukunftsorientierter). In der ersten Arabesque spiegelt sich auch Verlaines Vorliebe für ungerade Zahlen wieder: die ersten drei Abschnitte haben jeweils eine Länge von 5, 11 und 9 Takten—ein Ungleichgewicht, das zu der ätherischen, schwebenden Disposition des Werks beiträgt. Debussy schrieb sein letztes Lied, Noël des enfants qui n’ont plus de maisons, in den Tagen vor einer Operation im Rahmen einer Krebsbehandlung am 7. Dezember 1915. Es nimmt seinen Rat vorweg, den er einem jungen Komponisten im März 1918 von seinem Sterbebett aus erteilte: „Méfiez-vous de l’exceptionnel!“ („Seien Sie auf der Hut vor dem Außergewöhnlichen!“) Hier ist eine Schlichtheit, die aus jahrelanger Erfahrung resultiert—gewiss kein großes Lied, doch ein anrührendes, trotz seiner offenkundigen Siegesforderung am Ende. Der Komponist, inzwischen ein selbsternannter „musicien français“, scheint den Kult der Einfachheit zu prophezeien, der—in den Händen der Groupe des Six—in der französischen Musik nach seinem Tod tonangebend werden sollte.